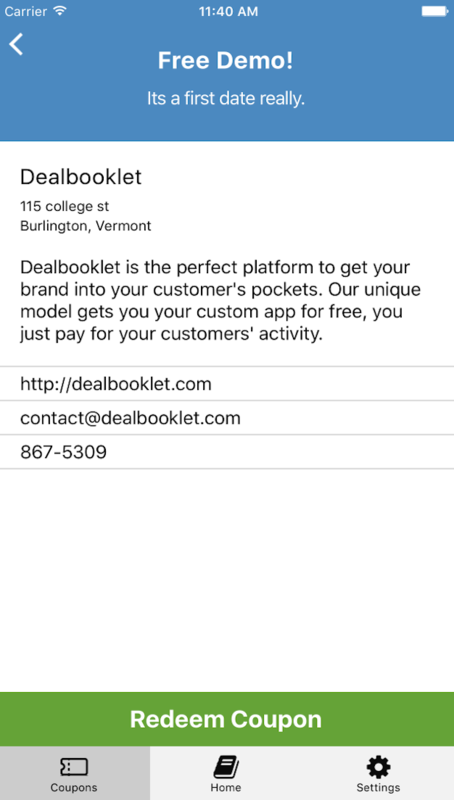 Dealbooklet allows you to deliver coupons and vouchers straight to your customer's mobile devices. Check out our demo app! Our app is available on Android and iOS, download it and take a look! What Dealbooklet can do for you. Your app goes in the app store for free. Content and branding can all be customized to fit your needs. Group your coupons into books and charge customers a fee to access them. Or give books away for free, its up to you! Track how your app is used and by who to inform your business. Customer data is secured with advanced encryption for your peace of mind. I think Dealbooklet is extra cool and would love to talk to you about setting up my brand! © 2016 daft labs. All Rights Reserved.